• The Oregon Measure of Economic Activity was 0.03 in August while the three-month moving average, which smooths month-to-month volatility in the measure, stands at -0.03 where “zero” for this measure indicates the average growth rate over the 1990-present period. • Manufacturing activity continues to bolsters the measures, particularly employment growth and average weekly hours worked in the sector. The construction contribution was neutral as the employment component rebounded from last month’s softness. • The household sector was restrained by still elevated unemployment and a declining labor force. The services sector made a negative contribution, partly attributable to a decline in financial sector employment growth. This may simply be a reflection of volatility in the employment components, and highlights the importance of track the moving average measure. • The University of Oregon Index of Economic Indicators™ rose 0.1 percent in August; the UO index has not decreased since September 2012. Initial unemployment claims fell, reversing some upward gains since this summer and signaling continued momentum in the labor market. Employment services payrolls slipped after posting a strong gain in July. • Residential building permits (smoothed) have been hovering in the 1,200-1,300 range for the past five months. Solid manufacturing readings continue to bolster the UO index, with core manufacturing (nondefense, nonaircraft capital goods) orders and Oregon manufacturing weekly hours worked both gaining during the month. Hours worked remain at cycle highs and indicates high demand that should foster additional job growth. Consumer sentiment (smoothed) rose in August; in general sentiment has returned to levels consistent with moderate spending growth. 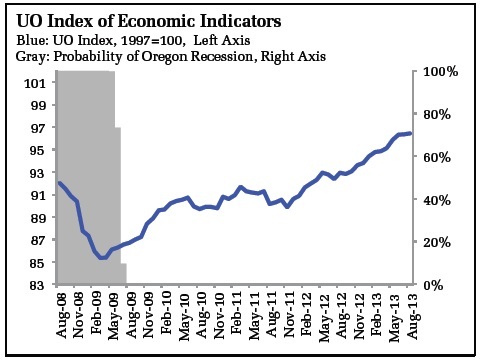 • Overall, the two indicators point to sustained expansion in Oregon at an average pace of activity. Economic expansion should be sustained as some of the impacts of fiscal tightening lift, although higher interest rates may slow the pace of improvement in the housing market. Note that a protracted federal shutdown would have a negative impact on growth and undermine the expansion.